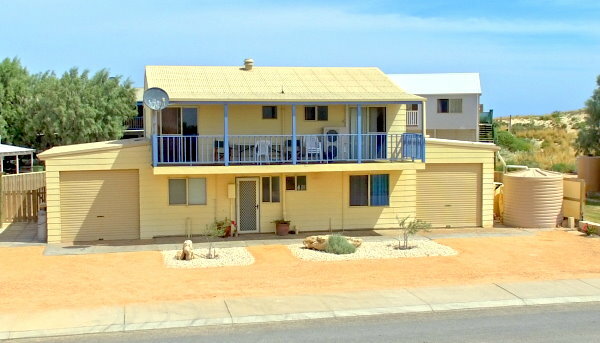 The completely self-contained lower floor unit of the house is an ideal and comfortable holiday venue close to the beach and all Coral Bay attractions. It has slate flooring throughout - easy to cleanup if necessary. There are 2 main bedrooms - both have 2 single beds that can be placed together. The other small bedroom has a children’s bunk bed. A lounge room (with TV), dining area and kitchen occupy the rest of the house. In the kitchen there is a gas stove with oven, microwave and a large two-door refrigerator. The kitchen is fully equipped with all crockery, cutlery and kitchen utensils. The laundry has a washing machine and 150L freezer. The main room has air-conditioning and all rooms have ceiling fans - except the room with the bunks, which has a pedestal fan instead. The unit is perfect for small families or couples - ideal for a maximum of four people - this number may be slightly increased for family groups. A brick paved pergola, gas barbecue and outdoor setting is at the rear of the house and is fenced for privacy. There is also a fish cleaning table and outdoor shower - great for rinsing off the beach sand. Other than linen and consumables - everything else is supplied. Linen is available, at an additional charge; please ask about this when booking. Bookings are normally taken from Saturday to Saturday, with tenants vacating the property by 9am. The caretaker at Coral Bay will check the property prior to occupation and is on hand to help with any problems that may arise. Please check the calendar for availability - we do advise that because of bookings coming from other sources the calendar may not always be completely up to date. You can get the latest information on availability by telephoning Bob or Jan on (08) 9437 6617 (+61 8 9437 6617 from overseas) or . If you would like more information or have a booking enquiry please contact us - but check the availability calendar first ! Generally bookings are taken from Saturday to Saturday, however please enquire if you have a different requirement, as depending on the time of year and other bookings, we may be able to accommodate a different booking time. Once we have confirmed the house is available and we accept your booking a refundable deposit bond/booking fee of $300.00 is payable within 7 days with full payment due 2 months prior to the commencement of your stay.